How do I sign into my Office 365 account from within Word, PowerPoint, Excel, etc? If you have the current version of Office, open any Office application and, in the top right corner, click Sign in. If you see the name for your account, you're already signed in. Type the email address and password you use with Office. Which account should I use while I'm using an Office application, I have a personal one too!? Since you may have two kinds of Microsoft accounts, like a personal Microsoft account accounts you created and accounts from your work or school that use Office 365, be sure you are signed into your MCA account! 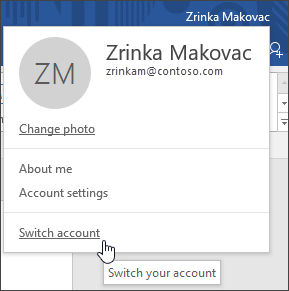 To switch between accounts in an Office application, click your name in the top right corner and click Switch account. In the Office application, select File > Account. Under User Information select, Sign out.